The funny thing is when I go through 15 years of data, I see that I was weight stable within 10% and usually 5% despite following wildly different diets. What I also mentioned in that blog post was how bloggers show a lack of transparency when they talk about their health. They tell their readers the good news and post less about when things weren’t working as well. This presents a false narrative to the reader. I’ve been guilty of this to some degree. In this post, I’m going to share the data that I have collected. 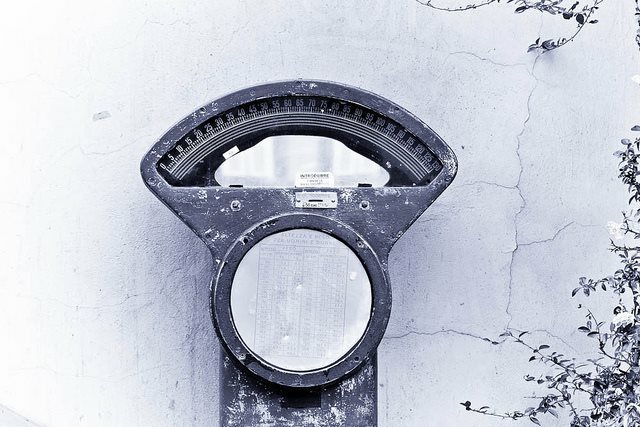 It is not a complete dataset, but I think there is enough information for the readers of this blog to better understand my background when they read a post related to my weight gain or weight loss. From January 4, 2003, to May 14, 2008, I weighed myself 175 times. Here is that data. For the record, I am 6′ 2.5 (or 189 cm). I can’t stand it when male bloggers talk endlessly about their weight but never mention their height. Chris Masterjohn did an entire podcast about the history of his weight and never said his height. 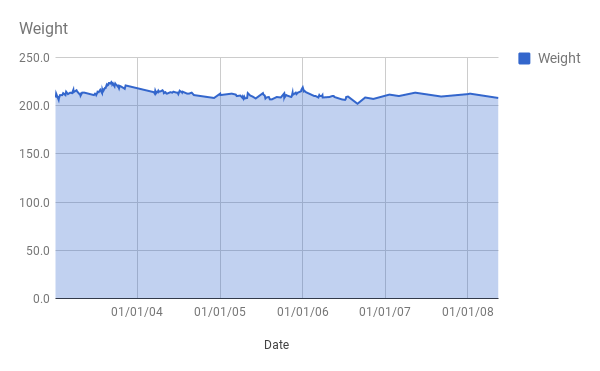 Around May 2008, I began going more Paleo and was experimenting with Intermittent Fasting. As a result, my weight dropped to 190-195 for a few years. Felt great. Then in 2012, my weight dropped down to 183 from eating too clean. I felt bad and looked gaunt. So for a year, I ate a lot of ice cream and kefir to get back to 195-200. Then in 2013, I hurt my knee. My activity level plummeted and I gained weight. Then after a year of driving in the Bay Area, I gained more. Last year my knee got 90% better, but I didn’t weigh myself until early 2017. I was 222. In retrospect, I wish I had kept more data in the 2013-2016 period, but my weight was not my focus at all during this period. So even though I had a dip for a few years, you can see that I have been mostly weight-stable. During this entire time period, I never counted calories and my activity level and diet varied a lot. Last year (2016), I didn’t weigh myself a single time. I wanted to focus on recovering my knee and not get sidetracked with fat loss. Now my knee is 90% recovered and my primary focus this year has been fat loss and so far it is going very well. This year I have lost 22 pounds so far and am down to an even 200, which I consider the upper boundary of my ideal range of 190-200. I hope this post wasn’t too boring, but I want to be more transparent when I discuss issues related to weight. I’ve never been fat and the one time I got super lean, I looked like hell. The numbers in this post will be the background for an upcoming post related to my new understanding of metabolism. Another metric to add to height and weight is age. How does age affect how you either lose or gain weight? Also, did you lose the 22 lbs. eating the peasant diet with lower fat and more carbs. Since you walk around Seattle, you might need more carbs than not. @Cathy – I don’t know the role age plays in fat loss. I do know as I get older, I have greater discipline and I know more information. So even if there is a decrease in metabolism, it would likely be offset by years of nutritional wisdom. I don’t want to give away the ending yet, but yes the peasant diet which is rich in carbs was helpful in losing the weight. But there is more to the story. That will be a future post. Will you be posting about your knee rehab, MAS? I have been struggling with a very persistent recurrent ankle problem and would love to learn about the steps you took to recover. @Geoff – That is a good idea for a post. Even if it doesn’t help others, it will serve as a resource I can refer to later. @Geoff – I started to write the knee post and then discovered that I already had. At the end of that post, I link to a resource with the exercises I used.